Today we are all a inured to ornamented ceramic-ware mass produced in China and elsewhere. As they became ubiquitous, we became desensitized to the relatively few hand ornamented ceramic pieces made in America. Our work, which is not even close to some of the most beautiful hand-painted ceramics from many other sources in this country and elsewhere is, nevertheless, hand made and should not be mistaken for the mass produced, mold-made ware from China. This post is a brief note on how we do some of the hand ornamenting of our cat fountain center pieces. The top left and bottom right pieces were carved then painted with several under-glazes. These under-glazes don’t need another glaze on top to make then glossy. Instead, they are coated with a wax resist which prevents the glaze, which will then be sprayed over them, from affecting the under-glazes. After spraying they are carefully washed of their over-glaze and fired in the usual way. On the fountain on the bottom left an under-glaze Rub was used. The glaze, Salsa, was rubbed into the motif then sponged off. 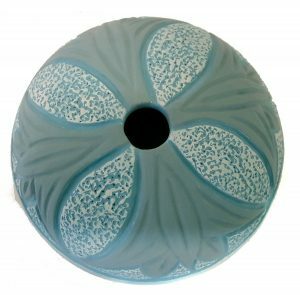 The piece was then sprayed with a harmonizing overglaze which did not obscure the motif but did bring out the gloss. The design on the top right was painted with under-glazes then sprayed with a Clear over-glaze which did not obscure the motif but brought out the gloss. 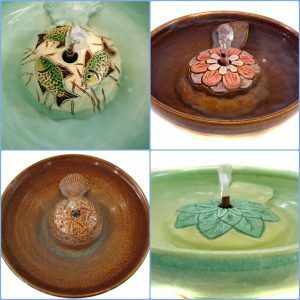 A few of the ways we try to bring beauty to our cat fountains.